As guests of Ferguson Kitchen, Bath & Lighting Gallery and Grohe, we were treated to “Once, the musical,” a Broadway show that won 8 Tony awards last week. We all thoroughly enjoyed it, as did the whole audience. 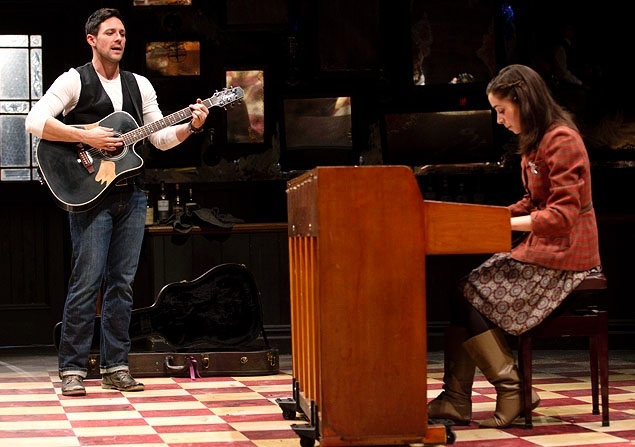 Once premiered at the New York Theater Workshop on December 6, 2011 (previews from November 15, 2011) and closed on January 15, 2012. Directed by John Tiffany with choreography by Steven Hoggett, the cast featured Steve Kazee (Guy) and Cristin Milioti (Girl). This production was nominated for Lucille Lortel Awards for Outstanding Musical (winner), Outstanding Director, Outstanding Choreographer (winner), Outstanding Scenic Design (Bob Crowley), Outstanding Lighting Design (Natasha Katz) (winner), Outstanding Sound Design (Clive Goodwin), and Outstanding Lead Actress. The production won the New York Drama Critics’ Circle Award for Best Musical. The musical then opened on Broadway at the Bernard B. Jacobs Theatre on February 28, 2012, officially on March 18, 2012, again with direction by John Tiffany and movement by Steven Hoggett. This production received eleven Tony Award nominations, winning eight, including Best Musical. The production won the Drama League Award, Distinguished Production of a Musical for 2011-12. In both the New York Theater Workshop production and the Broadway production, the cast also served as the orchestra. The minimalist set used for the Broadway production was a bar in center stage with chairs lining stage left and right. Exiting cast members simply stepped to the side of the stage and sat down. They served as the orchestra from these chairs. The bar was used at intermission as a working bar for the refreshment of the customers, rather than having a bar upstairs or outside.